UNIVERSITY PARK — Penn State’s bowl picture has started to look a little bit clearer following Saturday’s 22-10 win over Wisconsin and some other outcomes around the nation. The Nittany Lions close at Rutgers and at home against Maryland, so a 9-3 record seems to be in the cards. If that occurs, the two best-case scenarios would be the Peach Bowl in Atlanta, which is a New Year’s Six game, or the Citrus Bowl in Orlando. If Michigan beats Ohio State in two weeks and wins the Big Ten championship game, the Wolverines will be in the College Football Playoff. If the Buckeyes finish 10-2, they would end up in the Rose Bowl. In that scenario, a 9-3 Penn State team could be selected for the Peach Bowl at noon on Dec. 29. One caveat to that is, to be selected as an at-large for a New Year’s Six game, a team must be ranked in the top 12 in the CFP. Penn State currently is No. 20, but it will move up several spots this week because of losses in the top 20. If Ohio State beats Michigan and wins the Big Ten, the league could get shut out altogether in the CFP. The SEC could get a second team in to go along with Alabama, or Oklahoma could make it from the Big 12. If there’s no Big Ten team in the CFP, then Michigan and Ohio State likely would be selected for New Year’s Six bowl games. That would mean Penn State’s best-case scenario would be the Citrus Bowl at 1 p.m. on Jan. 1. 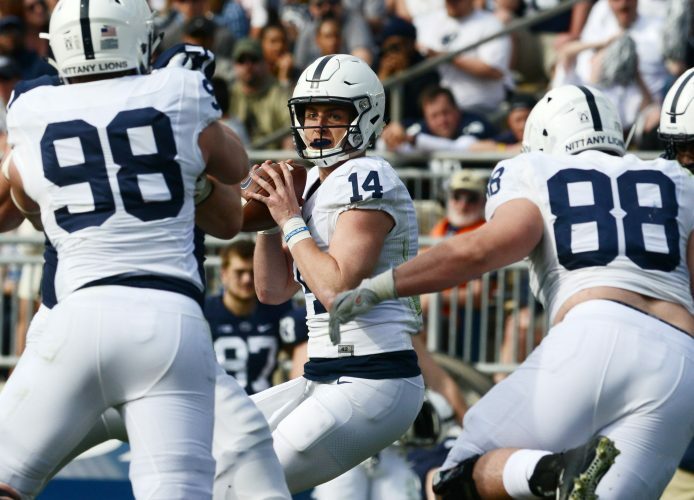 One of the big outcomes Saturday that impacts Penn State was No. 11 Kentucky losing at Tennessee. Kentucky seemingly had a strong path to a New Year’s Six bowl game, but not any longer. There’s still a lot of things that have to play out. If not the Peach Bowl or the Citrus Bowl, Penn State’s other most likely destination would be the Outback Bowl in Tampa at noon on Jan. 1.